Hyderabad’s real estate market has started picking up pace registering a growth of two per cent in the Jan-Mar 2015 quarter. 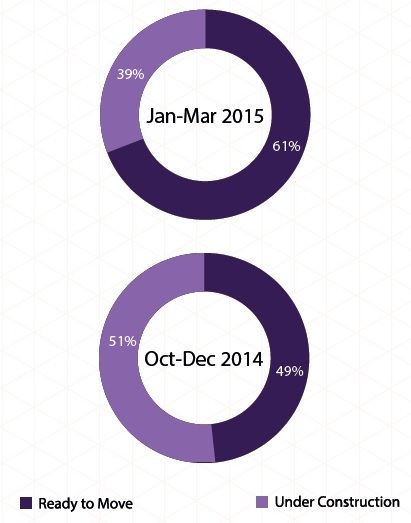 The previous quarter, Oct-Dec 2014, also saw prices going up in the same vigour. Affordable properties and new found political stability improved customer sentiments leading to a gradual and consistent rise in property values. Both State and Central Governments have taken significant measures to improve the infrastructure in the city. The latest proposals of development focussing on transit-oriented growth have not only benefitted the intra-city connectivity but also the real estate market. According to the Mercer’s Quality of Living Report 2015, Hyderabad was ranked the most liveable city in India and stood at 138th position at the global level. The annual Telangana Budget allocated considerable funds for development of affordable housing in the city. A big share of the funds have been assigned for civic and physical infrastructure such as roads, flyovers and metro. West Hyderabad continued to garner maximum interest from home buyers for both buying and renting homes. In the Jan-Mar 2015, Banjara Hills and Kondapur recorded the highest price appreciation to the tune of of 22 per cent and 11 per cent, respectively. Localities in the South such as Appa Junction and Dilsukh Nagar saw prices dipping to the tune of 10-11 per cent. Low land and ticket prices pushed the number of new launches up in the luxury category, however, the sale volumes of these properties remained low. An analysis of supply data reflected a hike in availability of premium properties in the budget of Rs 1-5 crore. West Hyderebad continued to have the best performing localities in terms of capital appreciation in the preceding quarter. Presence of IT industries and the upcoming Hyderabad Metro Rail at strategic locations were the prime reasons for surge in housing demand. 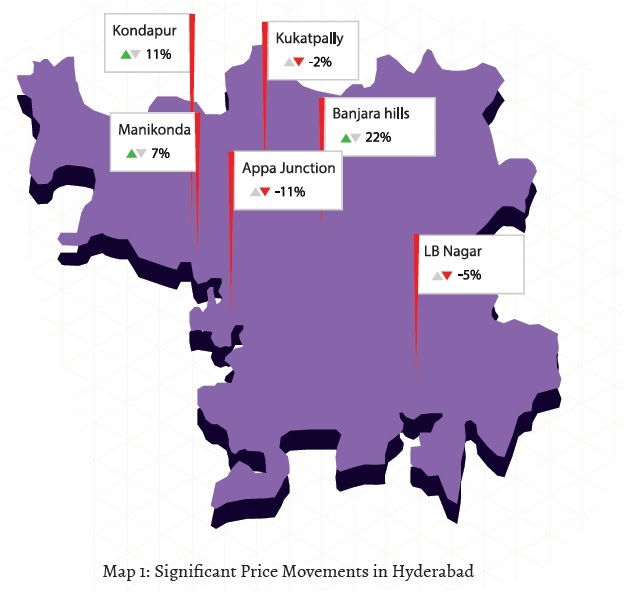 Being a premium locality, an IT hub and one of the most coveted addresses of Hyderabad, Banjara Hills recorded a price hike of 22 per cent. Hyderabad has observed increasing demand for premium properties and luxury homes since the separation of Telangana and Rayalseema, with maximum being observed in Banjara Hills. Located hardly 4km away from Gachibowli and offering properties at prices almost at par, Kondapur fared well due to presence of several ready-to-move-in properties and well-developed social infrastructure. Shaikpet, which registered a 10 per cent price appreciation, saw rise in housing demand due to several projects nearing possession by the end of 2015. The location offers luxury living at a much lower cost as compared to Jubilee Hills and Banjara Hills, located about 5-6 km away. The Jawaharlal Nehru Technological University area (JNTU) in Kukatpally Housing Board (KPHB) continued to clock healthy quarter-on-quarter price hike. Improved connectivity by the KPHB-HITEC City flyover, making it more accessible from the IT companies of Hitec City is known to be the prime growth stimulator. AS Rao Nagar is the only locality from East Hyderabad, which appeared in the list of top 10 performers. Healthy rental demand was noted in localities planned to become a part of the Hyderabad metro corridor. Kukatpally, KPHB, Ameerpet and Miyapur, thus, recorded 10-20 per cent spike in rental values. Chanda Nagar, too, recorded an increase in demand for rental properties due to its proximity to Miyapur, which will serve as the terminating station for Corridor I of Hyderabad Metro, starting at LB Nagar in the South. Presence of IT industries kept traction in Gachibowli high due a number of expats looking for rented accomodation. The locality emerged as the top grosser in terms of rental values with a reported annual hike of 23 per cent. Demand for luxury properties by the top-management professionals swept the rental rates by seven to 21 per cent in localities such as Banjara Hills and Jubilee Hills. An oversupply of housing units in Hitec City is the reason for plateauing rental rates. However, Kondapur, located about 4 km away, recorded an eight per cent increase in rental values due to its comparative affordability to Hitec City. While a 1000 sq ft house could be rented for Rs 10,000-13,000 in Kondapur, the similar was available in Hitec City for nothing less than Rs 15,000-20,000 per month. Narrow roads and civic issues such as paucity of water kept rental demand low in Nizampet and resulted in a drop in rental rates by 14 per cent. With IT Industry dominating the employment scenario in Hyderabad, the city recorded maximum demand and supply for residential apartments vis-a-vis other property types. Most housing units in the city fall in the price bracket of Rs 25-40 lakh. Supply of various property types such as apartments, builder floors and independent houses/villas in Hyderabad recorded slight variations in Jan-Mar 2015, as compared to Oct-Dec 2014. 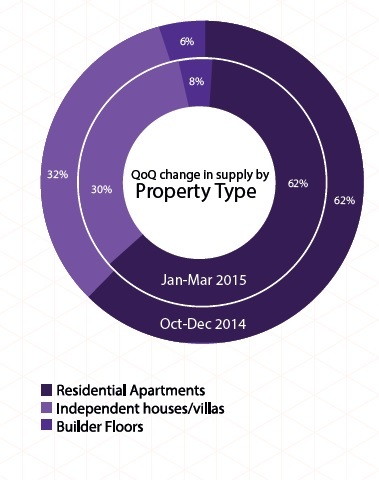 Residential apartments continued to remain the most supplied property type with over 60 per cent market share. The next most supplied property type in the city were independent houses/villas, which made up almost one third of the total market share. Supply of these units dropped marginally from 32 per cent in Oct-Dec 2014 to 30 per cent in Jan-Mar 2015. Across all major cities, Hyderabad witnessed maximum supply of independent houses/villas (30 per cent), followed by Chennai (26 per cent). The share of properties in the mid-income segment (Rs 25-40 lakh) continued to top the city’s supply chain. 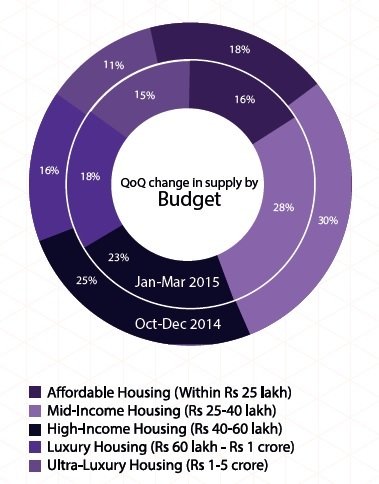 The share of ready-to-move-in properties in this budget range went up by 16 per cent in Jan-Mar 2015. Several projects under the affordable housing category (within Rs 25 lakh) were delivered in this quarter and supply of ready-to-move in affordable homes went up by over 13 per cent. The high-income bracket (Rs 40-60 lakh) was the second most supplied with almost one fourth of the market share (over 20 per cent). More than half of the properties in this budget category were ready-to-move-in. Overall, Hyderabad recorded a reduced supply of affordable, mid-income and high-income housing categories by six per cent. This supply was instead replaced by luxury housing (Rs 60 lakh–Rs 1 crore) and ultra-luxury housing (Rs 1-5 crore) categories. The ultra-luxury segment alone recorded a four per cent increase in supply. A major portion of the inventory has been delivered. In the luxury housing category (Rs 60 lakh – Rs 1 crore), supply of ready-to-move-in properties and under-construction properties was recorded in the ratio of 55:45. Maximum properties (45 per cent) continued to remain under-construction in the price bracket of Rs 40-60 lakh and Rs 60 lakh - Rs 1 crore. In terms of configurations, maximum supply was recorded for 2BHK and 3BHK units. Both the categories together made up almost 90 per cent of the total market share. Homes with 1BHK configuration cotinued to be the least supplied in the city. Close to 90 per cent of the total 1BHK units in Hyderabad are ready-to-move-in. In 2BHK and 4BHK unit categories, more than 60 per cent of supply was for ready-to-move-in units. This marked an increase of eight to 13 per cent since the previous quarter. The 3BHK unit category had an almost equal ratio of ready-to-move-in and under-construction inventory (52:48). 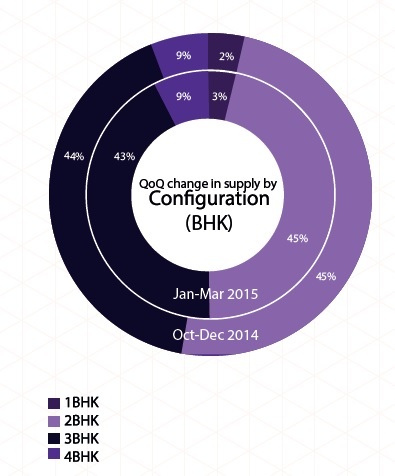 Supply of under-construction 3BHK units dropped by 11 per cent between Jan-Mar 2015 and Oct-Dec 2014. The city recorded an increased supply of ready-to-move-in properties this quarter. Overall, supply of these units went up by 12 per cent. It stood at 61 per cent as compared to 49 per cent in the last quarter. Supply of under-construction properties dropped to 39 per cent this quarter, from 51 per cent, indicating slow rate of new launches in Hyderabad. Out of the total under-construction properties, maximum were offered in the budget range Rs 25-40 lakh (mid-income housing), closely followed by Rs 40-60 lakh (high-income housing). The affordable category (property price under Rs 25 lakh) saw least takers and hence, lowest number of under-construction properties (11 per cent). In terms of property configuration, 3BHK units made more than half of the market share of the total under-construction properties. The next most constructed configuration was 2BHK units, which made up 37 per cent of the total under-construction properties. On the contrary, 2BHK units had the maximum supply (47 per cent) in the ready-to-move-in category, followed by 3BHK units (42 per cent). Smaller homes of 1BHK configuration were the least constructed in the city. These units made up hardly two per cent of the total under-construction as well as ready-to-move-in categories.